HAGERSTOWN, M.D. 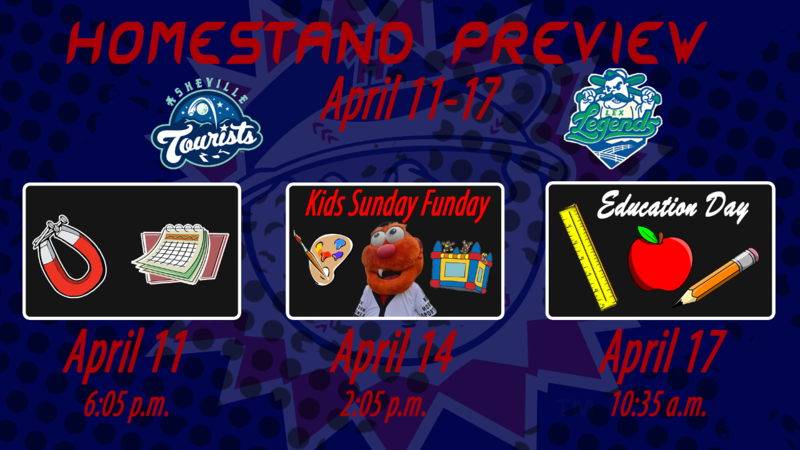 (April 10, 2019) - Hagerstown kicks off their home slate of games for 2019 with a seven-game homestand at historic Municipal Stadium. 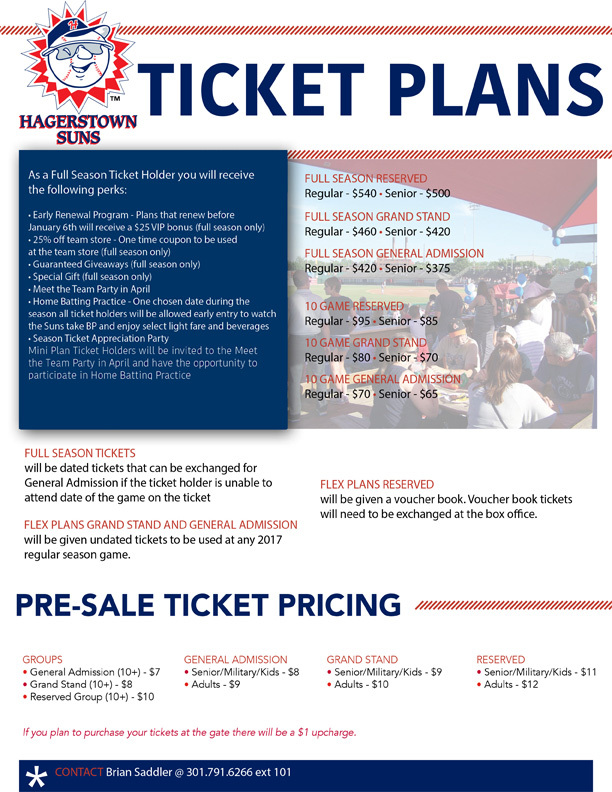 The Suns will host the Asheville Tourists, who are 4-2 this season, in a four-game set including Thursday's Opening Night. The Lexington Legends (2-3) will follow in a three-game series to conclude the homestand. Opening Night marks the first time the Suns have faced Asheville since May 2017. Hagerstown went 5-3 opposite the Tourists in the 2017 season. Against Lexington in 2018, the Suns posted an 8-6 record in 14 contests. ABOUT THE TOURISTS: Asheville has just two players returning from last season's squad which went 64-73. However, the Tourists still feature a strong cast which includes eight of the Rockies' top 30 prospects . On the mound, LHP Ryan Rolison leads the charge. Rolison was the Rockies' 1st round pick in 2018 out of Mississippi and posted a 1.86 ERA in nine starts with Rookie-level Grand Junction last season. Their top position player prospect is 1B Grant Lavigne . Ranked the fifth-best Rockies prospect by MLB.com, Lavigne was selected in the 2nd round of the 2018 Draft and batted .350 with 72 hits in 59 games at Grand Junction a year ago. ABOUT THE LEGENDS: Lexington's 2019 squad features five returning players from last season's South Atlantic League Championship team. The Legends start with 14 players who were selected by the Royals in the 2018 MLB Draft. The bevy of new faces for Lexington is highlighted by former Kentucky Wildcat RHP Zach Haake . A 6th round selection by Kansas City in 2018, Haake hit the ground running in his first professional season. Between the Arizona League and Pioneer League, Haake posted a 1.76 ERA in six starts with 14 strikeouts in 15.1 innings. LHP Kris Bubic will be a key contributor for Lexington. The 10th-best Royals prospect according to Baseball America was a competitive balance draft pick in 2018. He quickly proved his mettle in the Pioneer League, racking up 53 Ks in 38.0 innings for the Idaho Falls Chukars. SUNDAY FUNDAY: Every Sunday Funday, there's plenty of family fun and games planned at historic Municipal Stadium. Face painting, autograph sessions and more will highlight the afternoon, while kids can also participate in special pre and post-game activities. Before the game, members of the Suns Kids Club can play catch on the field. All kids will have the opportunity to run the bases after the game.